The ultimate living destination, fifteen minutes to the Medical Center, and downtown, twenty minutes to Greenway Plaza, and the Galleria, twenty five minutes to Hobby Airport, and Clear Lake, fifty five minutes to Galveston and the Gulf Coast. Shadow Creek is truly at The Heart of Everything! Shadow Creek Ranch has a team of top New Home Builders in the Houston area, they bring an exceptional selection of home designs to the community, this team of builders offer's an array of high quality designs that range in price from the $100,000's to the $1 million's. This 3,300-acre lake themed master planned community south of Houston is located in Pearland, Texas. Many beautiful new homes priced from $100,000 to $1 million are available from some of Houston's top builders, including Perry Homes, Emerald Homes, Ashton Woods, Coventry, DR Horton, Gehan, Newmark, River Oaks and Plantation Homes. Shadow Creek is one of the hottest selling new home subdivisions in Houston! Due to it's outstanding location, and beautiful landscaped surroundings many people have decided to call Shadow Creek their home. Just a short distance from many of Houston's major business centers and entertainment venues, such as the Medical Center, Hermann Park, Reliant Stadium, Astroworld and the rejuvenated Downtown Houston. Homes in Shadow Creek are fast becoming the most popular investment opportunities in the Houston Real Estate market! with some minor modifications. It will hold 800 children in grades K-6. Students in grades 9-12 will attend the Recognized Alvin High School. Additionally, AISD will soon begin construction on a new high school. Located on 115 acres at Highway 6 and McCoy in Manvel. 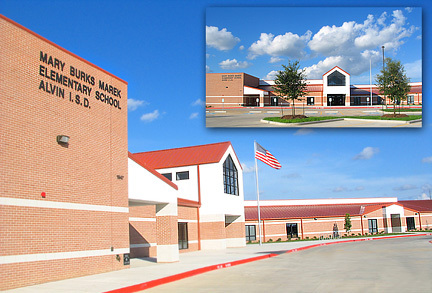 The school is approximately 13 minutes from Shadow Creek Ranch. Scheduled to open in the fall of 2006, it will be built in two phases. The first phase will be 220,113 square feet and will accommodate 1,500 students. The second phase will be 103,960 square feet and accommodate an additional 1,000 students. Construction is contingent upon bond election. For those students who are striving toward higher education, nearby Alvin Community College offers a varied curriculum with a host of classes and subjects. And all Houston's great universities are within minutes of Shadow Creek Ranch. The mission of Alvin Independent School District, the center for public education, is to offer exemplary programs enabling all students to possess the ability to learn for the rest of their lives and become productive citizens. 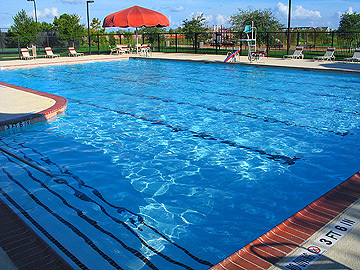 A 22-mile hike and bike network, Recreation center with tennis courts, pool, and playground. Center with shopping and dining, Corporate Campus, Hospital, Town Police Fire Annex, Restaurants. Churches With 7 school sites on 145 acres, Library, Day care facilities,700 acres of greenbelts and community parks.